For decades the Hollywood western had followed a tried and trued method of storytelling; White man = good, Indian = bad. But as the 1960’s drew to a close and the country became deeply embroiled in the political protests surrounding the Vietnam War, a few directors decided to invert the aforementioned concept, and the ‘revisionist western’ was born. With the peace movement going full throttle at the time, directors would recast the original perception of life amongst the Native Americans. Their trials and tribulations against the empowered peoples from the East who were infringing on their sovereignty, would serve as an allegory for the struggles of the peace activists who were fighting their own battle against what they conceived as ‘The Establishment’, the conservative warmongers who were forcing their way of life on the people of Vietnam. 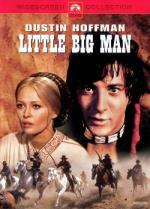 The first successful films in this new sub-genre were A Man Called Horse with Richard Harris and Arthur Penn’s Little Big Man starring Dustin Hoffman. Hoffman is cast as Jack Crabbe, a 121 year old pioneer who recounts for a journalist what is what like on the Great Plains in the latter half of the nineteenth century. As a boy crossing the plains with his sister, he is captured by the Cheyenne and is raised as a full-fledged member of their tribe. What makes his story so compelling is that it seems as if he has been witness to every major event that unfolded in the old west. From the Sand Creek massacre to Custer’s defeat at the Little Bighorn to the shooting of Wild Bill Hickok, Crabbe tells his tale from the perspective of both white man and ‘human being’, the term used by the Cheyenne to describe their native folk. Throughout the course of the film, events and circumstances will arise that will force him to adjust to new surroundings as he moves between the two cultures. In the end he will reluctantly acquiesce to a life in what he sees as the immoral and insane world of the conquering white man. The film can seem a little long-winded in spots and you also have to put up with the at times, annoying, sometimes over the top performance by Hoffman, who seems to be stuck in his Benjamin Braddock role from The Graduate. There are moments when you can catch yourself hoping that someone will just shoot him when he starts mugging in his usual self-gratifying way. Aside from this, Little Big Man was a refreshing new way to interpret the ‘Old West’ and with the fine performances of the supporting cast, is a film worth giving a chance. I have seen this film once, and that was along time ago. The one scene that's imprinted in my mind though was, when one of the chiefs goes on a mountain to die, but "fails"